[toc]You must have come across several hair care products for dry hair while strolling around hair care section of a supermarket. And might have used a few of them! But are they really effective? Most of you will have a mixed answer for this because all these hair care products though fight the dryness to some extent but do give a temporary solution. Then what should be done to moisture dry scalp? Can we leave dry scalp as it is. Never! 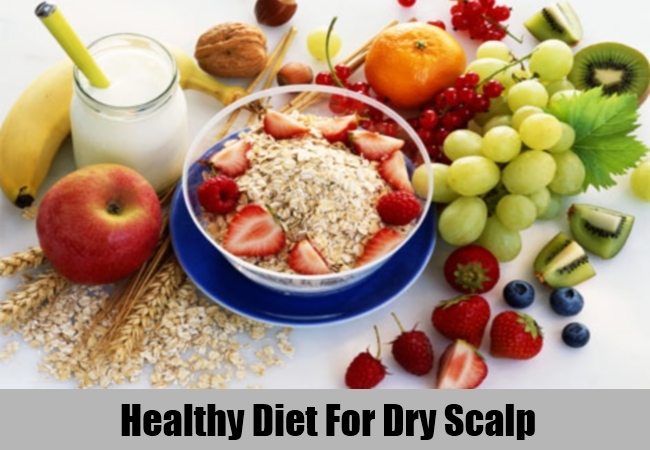 As dry scalp not only gives rise to itchiness, fizzy and fragile hair but also cause skin conditions like dandruff and fungal infection that might end up in huge hair loss. Whether men or women, no one can afford to lose hair. So, why not give a try to some natural remedies. And to top it follow some tips as well that goes a long way to retain the natural moisture of your scalp. Here is a combination of natural remedies as well as general tips to cure dry scalp at the comfort of your home. Egg contains nutrients and vitamins that nourish hair and scalp like no other natural ingredient. It contains protein which is in line with protein content of hair shaft. Thus it successfully repairs breakage and splits end when applied on hair. And to enhance its effectiveness, we add olive oil to the treatment that will cure dry scalp problem. So, get ready to try egg treatment. And the recipe is right here. Take a small bowl. Break 2 eggs in the bowl and separate the egg yolk removing the egg white. Add 2 teaspoons of olive oil and 1/8 cup of water into it. Mix them thoroughly. Apply it on hair after shampoo when the hair is damp from root to tip. Leave for 15 to 20 minutes and wash off with warm water. If you are a vegetarian or could not tolerate the strong pungent smell of egg on your hair then go for mayonnaise treatment. It works in similar fashion to moisturize dry scalp and hair. The additional benefit of using mayonnaise treatment is that it contains vinegar. And vinegar helps to cure any fungal or bacterial infection that might just started to proliferate in the scalp as dry skin is more prone to microbial infection. And to top it, mayonnaise is even simpler to apply. You just need to take ½ cup of mayonnaise and apply it on the dry hair and scalp evenly. Leave it for 15 to 20 minutes and then wash off with warm water. Finally shampoo your hair as usual. Oil treatment is one of the most effective natural remedies to fix dry scalp problem. Since ancient time people rely on oil to treat dry skin, scalp or hair problem. Even now, people in India use oils to moisturize hair and skin. A glimpse on the science behind its use reveals it all. Our hair follicles secrete fatty acids that nourish the hair and naturally moisturize the hair as well as scalp. When due to certain reason hair follicles fail to release fatty acids, our hair and scalp become dry. And applying oil topically does the job. So, give oil treatment to your scalp to control dry scalp problem. Just heat enough oil (according to the length of hair) in a sauce pan for a few minutes. Make sure the oil is hot to touch. Now let it cool for 30 seconds and then apply it on the entire head including hair. Warp your head with a shower cap and keep it as it is for 30 to 45 minutes. Finally, wash your hair with a mild shampoo. Avocado contains minerals and vitamins which are not commonly found in other fruits. Additionally, it is rich in natural oil that makes a perfect remedy for dry scalp and hair. So, try this home-made pack if you haven’t used this before for a silky smooth hair and supple scalp. Take a ripe avocado, remove the central hard portion from the pulp. Put the pulp in a food processor, pour in 2 tablespoons of extra virgin olive oil and 1 tablespoon of honey. Blend all the ingredients such that they are mixed well. Apply the pack in clean and dry hair and also over the entire scalp. Let it sit for 30 to 45 minutes and then wash off with warm water. Wash the hair with a gentle shampoo to complete the treatment. If you suffer from dry scalp problem then avoid using products containing harsh chemicals as much as possible. Most of the hair styling products like hair spray, dry shampoo, hair gel and hair dye contains harsh chemicals that not only steals away natural oil from the hair but also make the hair strand weak, damaged and fragile. It has been noticed that shampoo and conditioner containing chemicals such as sodium lauryl sulfate irritate dry scalp. Therefore, check the content of the product before buying them. Whatever we eat is directly reflected on our skin and hair. Particularly hair needs a high protein diet to remain healthy and lustrous. Hair strands are made of protein and eating a diet rich in lean protein helps the hair to grow fast and to gain volume. Similarly, our scalp and skin in the other part of body require omega 3 fatty acids and oil that helps to keep them healthy. So make ensure you eat a balanced diet rich in lean protein, fruits, green vegetables whole grain, nuts, seeds, fish and spinach. All these foods enrich the body with much needed protein, oil, and omega 3 fatty acids. Conditioning the hair scalp is also a great way to stay away from dry scalp. But go natural to condition your mane. And nothing is better than honey if you want a pure natural ingredient to condition your scalp. And for your convenience it is easy to use at home. You will need the following ingredients to prepare a natural conditioner: 2 tablespoons honey, 4 tablespoons extra-virgin olive oil, and 2 tablespoons glycerin. Mix them all and apply directly on the hair.